The ability to achieve spectacular special effects with concrete floor coatings, stains, and dyes is nothing new. But now a whole new alchemy is available for adding razzle-dazzle to your floors -- metallic coatings that allow you to "guild" your concrete to replicate the look of copper, silver, aged bronze, nickel, and other shimmery patinas. Some of these coatings contain real metallic powders, while others use special reflective pigments. They are especially popular for floors in retail, office, and restaurant settings, where a modern, upscale look is desired. To see some of the unique effects possible with metallic coatings, take a look at these stunning projects. 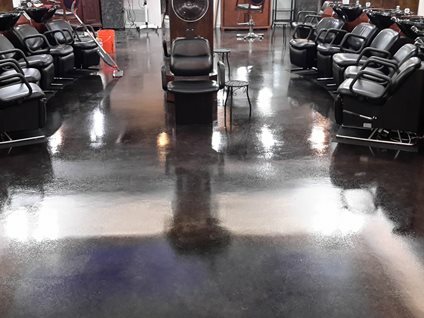 The new metallic floor in Steven Paul Salon & Studios dazzles clients with its rich mocha-like finish combining a black base and coffee-colored metallic pigments. 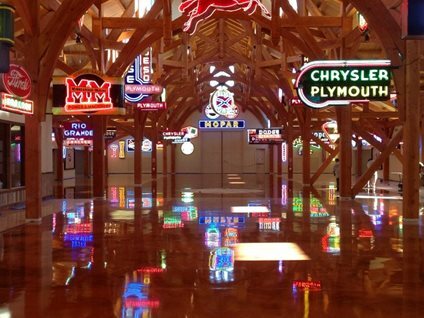 The floors in this 21,000-square-foot venue and showroom needed to complement the neon lights and shiny muscle-car chrome on display. A metallic coating with marble-like veining did the trick. See how the shiny metallic coating was installed in this impressive building. 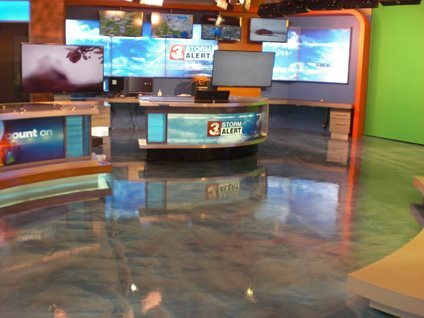 To bring this studio up to the standards of a high-definition broadcast, the existing concrete floor needed a major upgrade. The floor was refinished with a blue metallic epoxy coating with particles that look like glitter. The new floor gives the effect of walking on clouds and echoes the backdrop of the station’s logo. 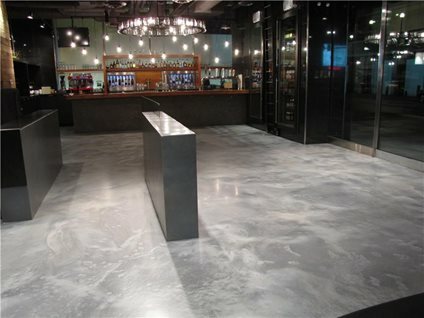 The owners of a high-end steakhouse in downtown Calgary go after the "wow" factor for their concrete floor by applying a two-tone metallic finish. A variegated look was achieved by applying the material in two coats containing different concentrations of silver and gray pigments. A blend of metallic color additives gives this decorative epoxy floor a rich, radiant finish. The coppery sheen was achieved by infusing the epoxy coatings with metallic pigments in three different color blends: russet, orange-gold, and charcoal. You can create eye-catching patterns, murals, and other special effects with this unique polyester resin, mixed with real metal powders. The seamless metal finish has the appearance of solid cast metal, with the look of brass, bronze, copper, nickel-silver, stainless steel, or aluminum. 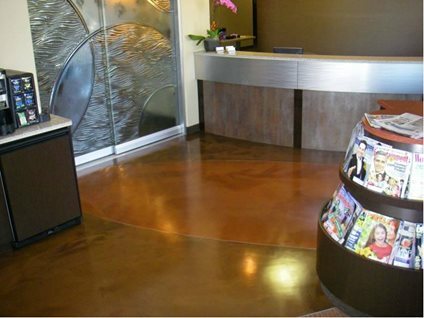 A multicolored palette of metallic-pigmented epoxies transformed the floor of a new oral surgery center into a work of art. 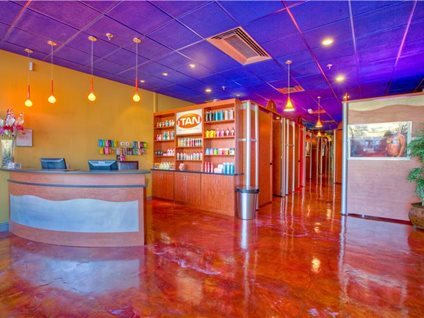 In addition to the shimmering decorative effects, the high-build seamless epoxy is chemical resistant and easy to clean, making it ideal for concrete floors in medical facilities, restaurants, showrooms, and retail environments.